About every Thursday I start to run low on produce purchased earlier in the week. Today, it seemed as if I was running low on just about everything. 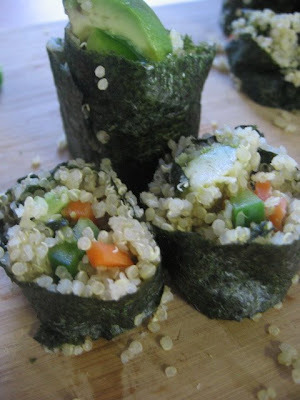 Apparently, I had enough to inspire quinoa maki rolls! I was out of rice and had quinoa, thinking it would be a healthy alternative I gave it a whirl. It was all a great idea until after I made the quinoa and chopped up leftover vegetables that I realized I only had one sheet of nori. Why would this happen? Whatever, I went through with it and made my one and only roll... I don't even know if my pictures are blog-worthy 'cause the roll was a tad loose and resulted in quite a messy lil' guy... Why did I have to run out of nori?? 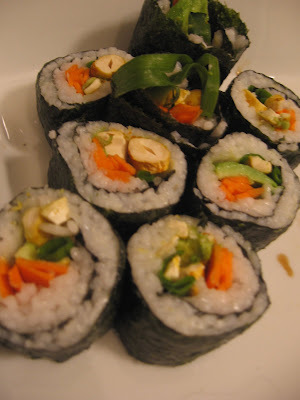 Pretty messy, healthy and delicious Maki! I made these just like any other maki roll. The quinoa stuck well to the nori, I just failed to roll the roll tight enough. So if you do make these with quiona, roll the suckers tight! I let my Mom borrow Hannah Kaminsky's book, My Sweet Vegan a few weeks ago. Sure enough, the sweet lil' lady gave the book back to me along with a bag of home made granola from Hannah's book. I was soo excited! I'd never tried the 'Power Hungry Granola' recipe in the book, but always wanted to. It was my motivation to get up in the morning for about two days... Why'd I pour such big bowls? Well, I was hungry and it gave me powa' for the day! Really, I couldn't help it-- it was so delicious and healthy! If you haven't picked up a copy of Hannah's book, do it! There are a variety of sweet recipes every vegan is dying to eat! A couple months ago my friend Brian sent me a package of goodies in the mail. This wasn't a bill or a thoughtful card, but a package! Wow-e! Quite the surprise! If it weren't for Netflix, I doubt I'd ever check the mail. Anyway, it was the most thoughtful thing and even included delicious home made vegan cookies! I don't think I've ever been sent cookies in the mail, it was a total treat. After eating a cookie and experiencing it's deliciousness, I knew I needed to make them for myself. 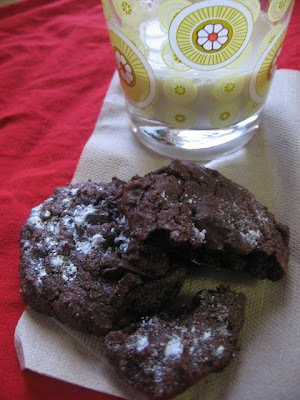 Immediately after chocolate comatose passed, I called up my friend and begged like a junkie for the recipe. Once I guessed his secret ingredient, he e-mailed me the recipe. Usually, I keep secrets really well... Unless it's something I NEED to get out... like the secret ingredient of these cookies! he he he. The recipe calls for fruit preserves! I used strawberry jam in my batch, a delightful duet of chocolate and fruit. MMmmm. Jam adds a brilliant texture and a lil' somethin' somethin' for the taste buds to ponder. Of course, my cookies did not turn out as well as his, but they were still pretty fantastic. I know I'll be making them again. Thanks for the new recipe, Brian! I loooovee sushi! Pickled ginger, soy sauce and wasabi were just meant to be! Last weekend, my sister recommend that we all get together and make sushi. Immediately, plans were made and sushi was being served. This is another meal that I love to prepare for a large group of people. It's so easy and only takes a little practice. Usually, people want to try rolling their own, it's fun to get everyone involved! 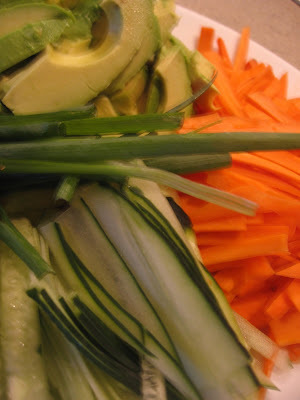 Okay, why it's so dang easy-- just thinly slice up whatever vegetables, fruits or nuts and place them on a platter. From there, just ask guests what they'd like in their roll and start rollin'! It's a great way to impress people. If only they'd know how easy it is! He he he. Vegetables ready to be rolled! Our sushi party was successful and pretty tasty. When we ran out of nori, my sisters husband started making lettuce wraps-- Brilliant! Give it a try if you don't like the smell of nori, it will still be delish. Don't be intimidated if your rolls aren't perfect...Serve drinks! Guests will forget what their roll looked like anyway! I'm only half joking... Really, people will be grateful no matter what their roll looks like. So, have fun and don't worry. Get out your wasabi, ginger and bamboo roller and make some maki! My family is far from religious. We do take advantage of holidays, rounding everyone up to have a delicious feast. Knowing my Grandma was preparing some sort of meat loaf this year for Easter, I made up my own to lentil loaf to pass. After we dished up our plates, my cousin next to me gave me the weirdest look and asked, "I thought you didn't eat meat?" He was surprised by my loaf and admitted he was fooled thinking it was actually meat. Silly Omnivores! Rinse lentils and bring to boil. Simmer until soft. Saute onion, garlic and vegetables until soft. Grind up pumpkin seeds in a food processor and mix everything together. Add more flax meal if it seems a bit wet, otherwise mix together and press into a greased loaf pan. Bake at 350 degrees for about an hour. Serve with whatever sauce your lil' lenten heart desires! Lentils! They're cheap, delicious and so versatile! This dahl recipe is filling and easy. Perfect for a busy weeknight meal. It makes a lot so it's great for lunch the next day. Traditonally, Dahl is a thicker saucier blend of lentils. My recipe is a little heartier leaving some lentils in their full form. Feel free to let them simmer a little longer to get a more traditional consistency. The fresh ginger and cilantro add a delightful kick. I left my ginger in bigger chunks, so each bite would have a lil' surprise! I recommend using the fresh stuff, but if you only have the dried and powdered on hand, I'm sure it will taste just fine. 1 1/2 teaspoon dried cilantro-- If you have fresh stuff- toss it in! Bring lentils and water to boil, reduce to simmer and simmer until desired consistency. Heat almond oil in a pan, add onion once warm and saute then add the garlic. Toss in the rest of the vegetables and fresh ginger. Let the vegetables become bright and add in the tomato sauce, lentils and spices. Simmer together until you're hungry and ready to eat! Serve on couscous, quinoa, rice-- whatever suits you! A few weeks ago I had some time off and spent it visiting a dear friend in Ottawa. Many of my friends in Green Bay questioned why I'd want to go to Canada... Especially in March. After visiting, I can only say good things about Canada. It's is beautiful! I even learned how to cross country ski in Gatineau Park, it's so pretty! When I wasn't hiking, skiing or drinking local micro-brewed beer, I was eating... I came home about 10 pounds heavier, but it was so worth it! Ottawa is a very veg-friendly community. They had great vegan/vegetarian restaurants, fun coffee shops and amazing sushi bars. Green Bay is limited in all of those areas, I had to take advantage of it! Ottawa has a large Middle-Eastern population and Shawarma joints on just about every corner! While I was there I couldn't get enough hummus, baba ghanoush, falafel and tabouli. I completely fell back in love with hummus and especially the local tabouli... Since I've been home, thats all I've wanted. I caved in tonight and made up some falafel. Not as good as what I had, but it came close! Instead of making a yogurt sauce, I made up an easy avocado sauce. This would be great on sandwiches or veggie burgers as well. 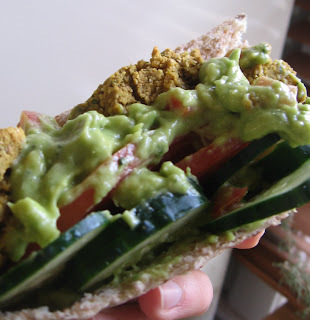 It's easy to toss together and adds a nice richness to the packed pita. Mash everything together and spread onto pita. Again, I make enough just for me, so feel free to double everything-- experiment! My Mom loves to cook, probably more than I do. She always prepared healthy meals for me and my sisters when we were younger. When she retired from teaching 3rd graders, she attended The French Pastry School in Chicago, IL. I am very proud of her, and she even makes delicious vegan treats when I visit. Thanks, Mom! When I was in elementary school, she went back to school to get her masters. Have I mentioned how proud of her I am? Anyway, I loved it, when I got home from school she was there and usually had some tasty snack for me. In the evenings, she went to class and my sisters and I were left to cook for each other, or eat leftovers. Being young and not yet skilled in the kitchen we often resorted to Ramen! Yes, Ramen! It was a childhood favorite, and a staple when no one would cook for us. At a young age, boiling a pot of water, adding noodles and a flavor packet made me feel like I actually could cook! There have been days since then when all I want is a comforting bowl of Ramen... It sounds disgusting, I know... Remembering how unhealthy it is usually sends me to the kitchen inspired to recreate a tasty childhood favorite. Last week, scrambling to toss dinner together I came up with my healthy replacement. This super easy and fast soup made me feel good about what I was eating and brought me back to a day when I'd let noodles hang out of my mouth on to my plate. Bring pot of water to boil, add soba noodles. Add oil to pan and toss in garlic and ginger, saute for a couple minutes and add in the vegetables. When the noodles are done, turn off the stove top and pour the noodles and water into the saute pan with the vegetables. Add the tablespoon of chili garlic sauce and simmer. Garnish with cilantro, salt n' pep, whatever-- enjoy! I approximate everything in the kitchen when I'm experimenting, this made about 3-4 bowls of soup. It's wonderful the next day for lunch.